Broncos coach Gary Kubiak has a list of concerns about his team that seems to grow by the week. After Sunday’s overtime loss to the Chiefs, special teams became a glaring concern after an array of mistakes that included multiple holdings calls on punts, two muffed punts by Jordan Norwood, an illegal formation penalty on a Chiefs field goal attempt, and a Broncos free kick that Tyreek Hill returned 86 yards for a touchdown. Critical stretch. The pressure is on high after the divisional loss. If the playoffs started this week, the Broncos wouldn’t be in the postseason field. Which means their final five games are raised in importance. But defensive end Derek Wolfe said the pressure would have been there even after a win. Derby’s development. 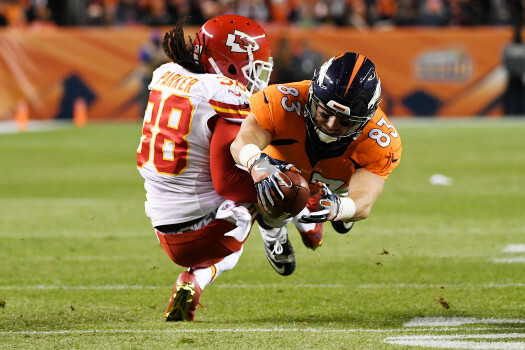 Among the bright spots for the Broncos’ offense Sunday night was tight end A.J. Derby’s involvement. Derby, who was acquired in a trade with New England in October, caught all four targets for a season-high 43 yards. One of those catches was for 13 yards on a critical third down in the fourth quarter that led to Bennie Fowler’s touchdown. Tale of two halves. Weak pass protection upfront stalled the Broncos’ offense and left quarterback Trevor Siemian little to time to create much of anything in the first half Sunday. So what changed in the second half?